A London teacher who raised £100,000 for survivors of the Grenfell Tower fire and who plays top-level football has been named in the top 50 shortlist for the annual Global Teacher Prize. 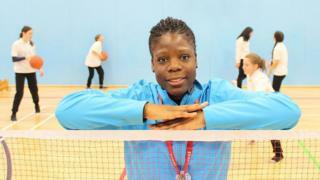 Eartha Pond is a finalist in the $1m (£750,000) teaching competition. The PE teacher, who plays for Tottenham Hotspur Ladies, is assistant vice-principal at the Crest Academy in Neasden, north-west London. She says it's great to see the value of teachers' work being recognised. The teachers in the final 50 are from 33 countries, in a competition run by the Varkey Foundation with the aim of raising the status of the teaching profession. Ms Pond, who trained as a teacher six years ago, has helped to run Girls Allowed clubs in schools, encouraging young women to take part in sport. As a footballer she played for Chelsea and Arsenal before signing for Spurs - and in teaching she has also been a top performer, with a strong record in results in sports qualifications. As a teacher, she says "every day is a lesson". And combining teaching with football, she says can feel like trying to live the lives of two people. She lives close to the site of the Grenfell Tower fire - and says that when she saw what had happened she began to raise funds. "I hoped to raise £5,000," she said. But in the end she collected £80,000 and then a school's sports day and support from local businesses took the total to £100,000. "It's my community, it was a natural reaction, my people needed help," she says of the efforts to support survivors. Ms Pond is one of four teachers from the UK in the top 50, in a shortlist drawn from more than 30,000 nominations. Andria Zafirakou, an arts and textiles teacher from Alperton Community School, north-west London. She has learned several languages to engage with local communities and worked to encourage more of her pupils to get university places. Rebecca Cramer, head teacher and co-founder of Reach Academy Feltham, south-west London. In its first GCSE year, 98% of pupils achieved good grades in maths and English. Tuesday Humby, principal of Ormiston Chadwick Academy, Widnes, Cheshire. She has helped to widen the horizons of disadvantaged pupils, with an "enrichment charter" which offers residential trips, theatre visits and an overseas trip to Kenya. The winner will be presented next year with their prize at a ceremony in Dubai. Last year's winner was Maggie MacDonnell, who teaches at a remote village school in the Canadian Arctic and who has campaigned about the problem of youth suicides in the Inuit community. The winner was announced by a video-link with astronauts on the International Space Station and with a message from Canadian Prime Minister Justin Trudeau. Sunny Varkey, founder of the Varkey Foundation, congratulated the finalists and said: "We intend to keep this momentum going as our journey continues to return teachers to their rightful position as one of the most respected professions in society."